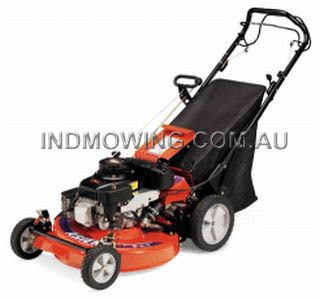 Ariens® Residential Walk-Behinds make short work of yard work. Afterall, they're engineered to be tough on unruly lawns but easy on you. The LM 21S Deluxe features adjustable handlebars, safe and upright operator's zone starting, a 3-in-1 system that lets you quickly convert from bagging to mulching to side-discharge, and all are self-propelled. These models are great for 1/4 acre sized yards. • The Self-Propelled Infi-Speed™ Drive System with speeds up to 4 mph. • NEW Bag-N-Drag rear bagger kit comes standard on Model #911099. • The 3-in-1 System lets you change quickly from mulching to bagging to discharging and get the job done fast. • Height Adjustment Brackets give you 6 cutting heights. • Multi-Position Ergonomic Handlebar reduces wrist and hand fatigue. • Baked-on, Powder-Coat Finish resists abuse from fertilizers, chemicals, and moisture. • Solid-steel Axles and 14 Gauge Stamped-Steel Deck keep this machine going year after year.